There were no madrasas in the early period of Islam. Their formation can probably be traced to the early Islamic custom of meeting in the mosques to discuss social and religious problems. It was in this early period that ordinary people used to gather around certain educated people who had knowledge and could guide them on religious matters. The religious scholars later came to be known as shaykhs, and when they started giving regular religious sessions they were called majalis. Jami'at al-Qarawiyyin, in the city of Fez, is considered the oldest madrasa in the Muslim world, established in 859. The first major academic institution in the Muslim world, however, was founded by Nizam al-Mulk Abu Ali al-Hasan al-Tusi (10181092), the celebrated Persian scholar and vizier of the Seljuk Empire. Later, Nizam al-Mulk established numerous madrasas all over the empire that, in addition to providing Islamic knowledge, imparted secular education in the fields of science, philosophy, public administration, and governance. Even though the majority of madrasas during subsequent centuries would remain centres of Islamic learning, many of them produced renowned scholars and philosophers who contributed greatly to secular knowledge. This is especially true for madrasas in Spain, a country that Muslims ruled for almost 800 years; a period that is usually referred to as the Golden Age of Islamic advancement in science, technology and philosophy. It was Islamic scholars from Andalusia in Spain who were said to be responsible for preserving (and further contributing to) Greek science and mathematics -- knowledge that was on the verge of being lost during the Dark Ages in Europe. During the rule of the Mamluke, or "slave," dynasties in the medieval Middle East (1250-1517), many of the ruling elite founded madrasas through waq'f, a religious endowment. The Mamlukes ruled Syria and Egypt after a group of generals seized the throne of the Ayyubid dynasty in 1250. Mamluke soldiers had been used in the Islamic world since the 9th century, and they often exploited the military power vested in them to seize control from the legitimate political authorities. Madrasas were a powerful symbol of status for the ruling Mamluke elite, and an effective means of transmitting wealth to descendants who could assume power but were unable to inherit. Wealth and status were, thus, guaranteed for the sons of Mamluke rulers through waq'f within the madrasa system. The madrasa system gained new impetus during the Ottoman Empire. The first Ottoman madrasa was established by Orhan Gazi in Iznik (Nicea) sometime in 1330-31, and he arranged sufficient waq'f to meet its financial needs. The subsequent tradition of the Ottoman Empire, throughout its conquered territories, was to construct a mosque with an adjoining madrasa. The traditional courses in these madrasas, taught invariably in Arabic, were Tafsir (Koranic interpretation), Shariah (Islamic law), Hadith (sayings and deeds of Prophet Muhammad), Mantiq (logic), and Islamic history. Science, alternative languages, or non-Islamic history were a rarity, if not completely absent in madrasa education. The deliberate policy of Ottoman rulers to conserve this primitive madrasa education throughout their empire was, many scholars believe, not only due to their failure to keep-up with the secular knowledge of modern science and technology. Ottoman rulers, not generally considered unjust, nevertheless believed it was easier to rule their vast territory by providing an unvarying religious education, however primitive. The origin of madrasa education in the Indian sub-continent is difficult to trace out. One can assume that it started as Islam spread further East. It was the Sufi order of the Muslim faith that started establishing madrasas in the Indian sub-continent and in Central Asia. In these Sufi madrasas grammar, poetry, literature, logic, mathematics, and other disciplines of Islam were taught. As most of the knowledge about Islam was recorded in Arabic and Persian, the in the Indian sub-continent became places for learning Arabic and Persian. Every student aspiring to reach the highest level of madrasa education had to learn these two languages, as it is with English today, whatever his mother tongue was. The most renowned poets of India at that time were borrowing from the Sufi traditions of Persia and Central Asia and composing their poems in Persian. Madrasas were also learning places during the Muslim rule in India. Indeed, it was the only place imparting knowledge in different disciplines, even though it was not modern or up-to-date considering educational advancement in Europe. After the British occupation of India, madrasa education made a dramatic U-turn. The British introduced a new educational system, and thereby modernised education. The Muslims, however, considered it a threat to the Islamic identity of the Muslims and, through madrasa education, they took upon themselves the task of opposing the cultural and educational hegemony of the British until after 1857, when Sir Syed Ahmed Khan came into the picture. Sir Syed was the first Muslim who realised the need for modern education for the Muslim community for its very survival in India. He had a strong passion for education and, while pursuing studies of different subjects including European jurisprudence, he began to realise the advantages of Western-style education which the British offered across India by establishing modern schools and colleges. Sir Syed was a devout Muslim himself, but he criticised the influence of traditional dogma and religious orthodoxy of the Muslims and earnestly appealed to them to accept modern education. Sir Syed established a modern school in Aligarh, and laid the foundation stone of the Muhammadan Anglo-Oriental College in 1875. His pioneering work for modern education for the Muslims received support from the British, although it was intensely criticised by orthodox religious leaders who were hostile to any modern influences. Sir Syed's new institution attracted a large student body from the Muslim gentry and middle classes, and it helped Muslims in the Indian sub-continent overcome the orthodoxy of madrasa education. 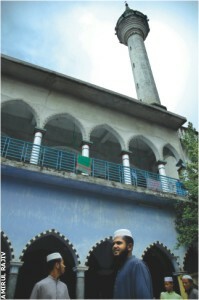 Madrasa education in Bengal was in the same state as it was in other places in the Indian sub-continent. In 1780, Alia Madrasa College was established in Calcutta "to promote the study of the Arabic and Persian languages and Mohammedan law, with a view more especially to the production of qualified officers for the court of justice." There was an important reason for this action too. The government required competent and capable people who could read and explain the book of law that was written and available in Persian. Warren Hastings, the first Governor-General of India (1773 to 1784), responded to this need by establishing the Alia Madrasa College. A Sanskrit college also received British patronage for similar reasons. Thus, both the Hindu and Muslim theologies received British favour. Actually, until the end of the eighteenth century, learning and education in India at large were decaying. For Muslims, it was madrasa where Arabic and Persian were taught whereas, for Hindus, it was tols, or institutions for Sanskrit learning that existed. But the Hindus, especially the Bengali well-to-do Hindus, overcame the trap by educating their children in schools and colleges that were established and run in Calcutta and other places by some locals, Anglo-Indians and missionaries. One Robert May set-up a school in Chinsurah in 1814, and within a year he founded sixteen other schools in the neighbourhood. Drummond, Sherburne, Martin Bowle, and Arratoon Peters were the famous English schools that some Anglo-Indians started. These English schools, and thereby Western education at that time, were the sole monopolies of the Hindu communities. As said before, Muslims avoided it because of nostalgia for their past glory, and other socio-political reasons. The Muslims thought they could find their own power and lost glory by turning to old Islamic values and education only, and by avoiding all Western influences. On October 21, 1853, His Lordship the Governor of Bengal suggested that "a new general college should be established at Calcutta by the government and designated "The Presidency College … The College should be open to all youths of every caste, class or creed." On June 15, 1855, the Presidency College was formally established. The scholars of the College Department of the Hindu College were transferred to the Presidency College, and 101 new admissions were made. Of these 101 pupils, two were Muhammadans, the rest were Hindus. Thus, the British divide and rule policy, and Sir Syed's efforts to give Muslim youths modern education, had a spill-over effect on the Muslims of the sub-continent, including in Bengal. Real change in the Muslim mind, especially of the Bengali Muslims, occurred after the foundation of Muslim League (1906), and more so when Dacca University was established in 1921. 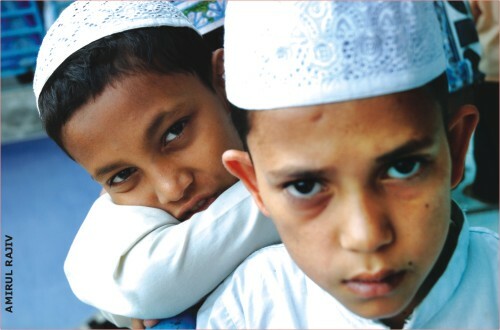 Muslim society, however, was divided truly due to Muslim boys getting modern education. The reactionary group, especially the poor, continued sticking to madrasa education, because it was traditionally and mostly free, and survived on charity. Poverty was, no doubt, the most important reason why Bengali Muslims, the poorest community of the Indian sub-continent, preferred it. Well-to-do Muslims, however, went for modern education. The creation of Pakistan, however, was a turning point in the social, political, and economic life of the Bengali Muslim, and establishment of Bangladesh as an independent country accelerated the process with further impetus. Growth of madrasas did not halt after creation of Pakistan, or since Bangladesh became an independent country. A madrasa is a holy institution even today, and nobody bothers what children learn in this sort of primitive institution. Open discussion on madrasas is taboo. What a pathetic situation. When India was colonised by the British, they introduced a new educational system in the country. The Muslims rejected it and, as we already mentioned, the madrasa system took upon itself the task of opposing the cultural and educational hegemony of the British through education. But who is doing hegemony now in our own country, and against whom we are showing our apathy? And why do we need this useless, primitive, madrasa education? The madrasa represents a conservative form of theology and jurisprudence which is ill-suited to a modern society. It has nothing to do with Islam. It is contradictory in some ways to what the prophet of Islam preached, and encouraged Muslims to follow. What is taught in madrasas is outdated and unscientific, for example, Deoband still insists that "the sun revolves around the earth," and they have "special seating arrangement for invisible Jinns." Madrasa curricula, in most cases, offers courses like "Koran-i-Hafiz" (memorisation of Koran), Alim (to become a scholar in Islamic matters), Tafsir (Koranic interpretation), Sharia (Islamic law), Hadith (sayings and deeds of Prophet Muhammad), Mantic(logic), and Islamic history (mostly constructed, and invariably avoiding any discussion on weak points of old Muslim leaders). The modern Muslim's concern does not seem to be brotherhood, equality, democracy, concern for fellow human beings, honesty and uprightness that the prophet of Islam preached, but idiotic rituals and obligations that vested interest groups passed of as Islamic. One can understand a wealthy intellectual in a rich country learning Tafsir, Sharia, or Hadith out of personal interest and thirst for ancient knowledge, but why should a poor man (rather the very poor one) need to memorise the Koran or to know the Koranic interpretation of things? 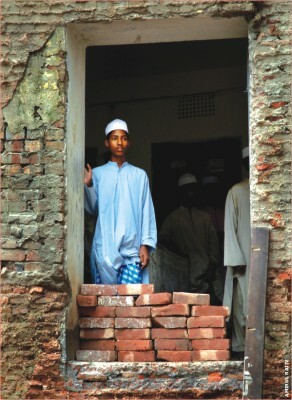 And most surprisingly, the madrasa is not dying, but growing like mushrooms in Bangladesh. A recent report says that, from 2001-2005, madrasa growth was 22.22% against 9.7% growth in general educational institutions (Bangladesh Economic Review Statistics). The number of madrasa teachers rose by 16.52%, whereas it was 12.27%. for teachers in schools and colleges. During the above period, the number of students increased by 10.12% in madrasas, whereas increase in enrolment in general educational institutions was 8.64%. There are over 9,000 government-registered madrasas in Bangladesh, but nobody knows how many non-registered madrasas there are across the country. A report by one Abdul Jabbar, secretary general of Bangladesh Qawami Madrasa Education, says that the board has a list of about 15,000 Qawami madrasas, apart from many that are not listed with anybody. The scenario is frightening. How can a nation leave her young people to be taught such primitive subjects by those ignorant teachers who do not have any education worth mentioning themselves? What wastage of time and meagre resources of a poor nation, directing her young to an education unworthy of being called so. What will the nation do with millions of these ignorant young men and women when they come into the job market and enter practical life, with the ability to recite the Koran or explain the Tafsir, Hadith, or Mantic only? Don't we need to do something about the madrasas now? And if our answer is "yes," what action should be taken immediately? The first action, one can rightly say, would be to re-name our schools and colleges. But the most important action will be to frame a uniform curriculum for all our schools and madrasas. Then, and the most difficult action will be to retire all the madrasa teachers who are unqualified. They could be provided with other jobs if possible, but it must be made sure that they never again get any opportunity whatsoever to teach anything. The madrasas and their teachers have done great and incurable damage to us, and the Muslim society at large, and it is time that they and their role in any nation building activity are stopped for good. Religious education should be given along with general education. Religion should be a non-obligatory subject, and taught only in 7th and 8th class for those students who want to learn it for personal interest. Courses like Koran-i-Hafiz, Alim, Tafsir, Sharia, Hadith, Mantic, and Islamic history shall be offered as subjects at the B.A., M.A. and Ph.D levels, making them respectable and something only for highly educated intellectual people. Religion is an important matter. Whether we like it or not, people cannot live without a religion. But when religion is left to the ignorant, life could be hell on earth. The situation in Pakistan, Bangladesh, and other Muslim countries proves this remark candidly, and the sooner we do something about madrasas the better it will be for us, and surely best for Islam. Tayeb Husain writes from Lund, Sweden.